3 Seater Chaise Sofa & Armchair. 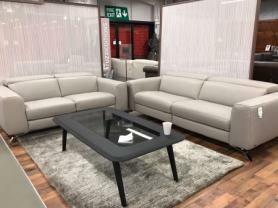 This luxurious fully upholstered sofa and armchair in soft grey Italian leather with ultra stylish chrome feet in a must have for any ideal home living space. This sofa is a very modern design and comfortable suite, the craftsman quality is apparent and very much so in this elegant designer sofa and armchair. Available now at Furnimax, come down and experience this suit for yourself.